Tesla (NASDAQ: TSLA) plans to start delivering its all-electric trucks by 2020, a major third-party logistics provider says. Other major truck OEMs such as Daimler (XETRA: DAI) and Volvo (Nasdaq OMX: VOLVB) will start delivering their electric models as early as next year. But electric semis still will not be ready for the broader market for up to a decade, according to industry experts. Speaking at a symposium sponsored by the University of Pennsylvania, NFI Industries vice president of fleet services James O'Leary says the company ordered 10 Tesla Class 8 trucks, which are expected to be delivered in 2020. "They are staying relatively consistent with their timeline, even though Elon doesn't talk about it on their earnings call," O'Leary said. 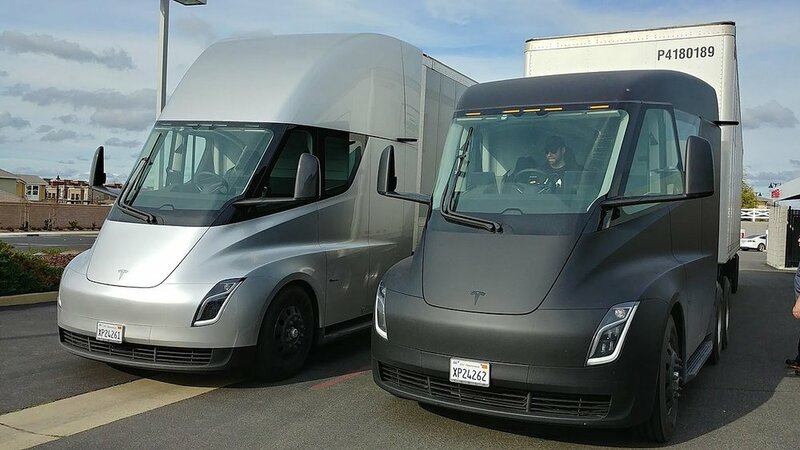 The Tesla trucks are one part of NFI's test of the viability of electric trucks for its fleet. The New Jersey-based logistics company also has 10 electrified Freightliners on order from Daimler, which released its first two electric models in June. The Daimler trucks are expected to be delivered in the second quarter of next year. NFI is also taking part in a project sponsored by the state of California to test Volvo's all-electric trucks starting next year. O'Leary says the interest in electric trucks partially stems from NFI's own goals of reducing emissions across all segments of its fleet. In addition to trucks, NFI is testing forklifts, yard horses and other equipment from Volvo, Meritor (NYSE: MTOR) and China's BYD (OTC: BYDDY). But the push to electrification also comes from shippers concerned about reducing pollution in their supply chains and the hype around new technology that can do so. "Nobody in North America was talking about electric vehicles until your local news outlets picked up the rollout of the Tesla semi," O'Leary said. "That led basically to what we call the Tesla effect. Now shippers are asking their carriers where you are with electric vehicles." Business conditions also play into NFI's interest in electric vehicles. With some 800 drayage trucks in Southern California, the company faces increasingly stringent emissions laws. The Clean Air Action Plan of the Ports of Los Angeles and Long Beach have progressively phased out older trucks for newer, lower emissions models. The cities of Los Angeles and Long Beach each enacted laws this June requiring that all trucks be zero emissions by 2035. As the range of electric trucks are still limited, drayage provides a perfect market for testing electric trucks on the road, O'Leary said. "It just makes sense considering the range of our vehicles," O'Leary said. "The average length of haul for the industry is in the 400s, but ours is in the 300s." Despite the advances in electric semis, fleets still face unknowns. The cost of truck remains high relative to diesel. Tesla has given an indicative price of $180,000 for its semi, but O'Leary said the actual cost may be higher as has occurred with Tesla's passenger vehicles. Electric vehicles are also expected to have lower maintenance costs due to fewer moving parts. But while the world's diesel fleet has a broad network of parts distribution and mechanics for repairs and servicing, the same is not true for electric trucks. Beyond the capital cost of the truck, fleet owners face the cost of installing charging stations for the vehicles. Moreover, the price of electricity needs to come down to make electric trucks viable, O'Leary said. The state grants as part of the Volvo project help offset these costs. "I don’t know if any of it makes sense without government funding," O'Leary said. Range remains a key hurdle for wider adoption of electric trucks. Venkat Viswanathan, an assistant professor at Carnegie Mellon, says electric trucks should be able to get roughly a 160 mile range by 2020. But extended range electric trucks will not be available until the middle of the next decade. "It's likely that by 2025, we will be able to make a 750-mile range battery," Viswanathan said. Electric trucks are likely to also require multiple charges during the day given the current technology, said Mike Roeth, the executive director of the North American Council for Freight Efficiency. That creates more wait time for drivers and cuts into a truck's earnings capacity. "There's a while before we get to parity with diesel trucks," Roeth said. "In some cases, eight, ten or 15 years."